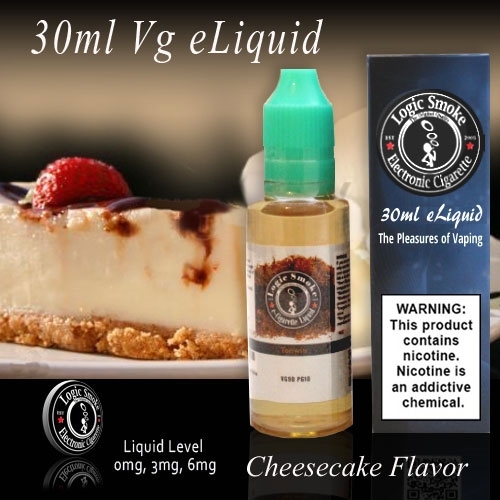 You can get that same flavor from our Cheesecake flavored electronic cigarette e-liquid. Load your heavy duty clearomizer with Cheesecake flavored e-liquid, attach to your favorite high powered MOD and you'll thoroughly enjoy this calorie free taste phenomena! Great all by itself, but think of the mix-in possibilities! Cherry cheesecake, Blueberry cheesecake! Peach cheesecake! Better yet...White Chocolate cheesecake.. Check out all of our e-liquid flavors and create your own unique taste explosion with Cheesecake flavored e-liquid today! Our 90/10 VG/PG blend is just what you are looking for if you are a MOD user. This e-liquid has been specially formulated to work with MOD batteries and the heavy duty clearomizers and atomizers meant to be used with them. VG or vegetable glycerin is a thick substance that will clog many of the more simplistic clearomizers. Having more VG in your e-liquid gives you super clouds of vapor and wonderful, full flavor that will make you keep coming back for more. Not only is the 30ml bottle convenient and easy to take with you as you're on the go, but it's also a great size economically if you're planning to stock up. They are great for refilling travel bottles or directly filling up your tank, as well as to be save for a rainy day since they've got a great shelf life. We do not carry this e-liquid in any strength higher than 06mg of nicotine because e-liquid that has a higher concentration of VG (vegetable glycerin) produces a much deeper throat hit and can cause discomfort and coughing along with a burned or harsh taste when too much nicotine is added. Also, because of the resulting deeper throat hit, higher nicotine levels aren't needed.